a lysosomal storage disease due to sphingomyelin accumulation in the reticuloendothelial system; there are five types distinguished by age of onset, amount of central nervous system involvement, and degree of enzyme deficiency. 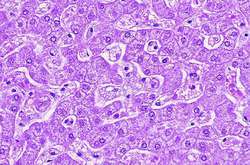 At least some types are characterized by foamy reticular cells containing phospholipids which infiltrate the liver, spleen, lungs, lymph nodes, and bone marrow. lipidosis with accumulation of sphingomyelin in histiocytes in the liver, spleen, lymph nodes, and bone marrow due to a deficiency of sphingomyelinase; associated with hepatosplenomegaly, physical and mental retardation, and neurologic manifestations; macular cherry-red spots may occur at a later stage; occurs most commonly in Ashkenazi Jewish infants and leads to early death; a more benign form may occur in adults. There are several variants: type A, the classic infantile form; type B, the visceral form; type C, the juvenile form; type D, the Nova Scotia variant; and type E, the adult form; all are of autosomal recessive inheritance with types A and B caused by mutation in the acid sphingomyelinase gene (SMPD) on chromosome 11p. An inherited disorder of lipid metabolism characterized by the accumulation of lipids in the spleen and liver and sometimes in the lungs, bone marrow, and brain. It is divided into several types, one of which occurs chiefly in infants of eastern European Jewish descent. an inherited disorder of lipid metabolism in which there are accumulations of sphingomyelin in the bone marrow, spleen, and lymph nodes. The disease, which in the United States and Canada is most common among Jewish people, begins in infancy or childhood and is characterized by enlargement of liver and spleen, anemia, lymphadenopathy, and progressive mental and physical deterioration. There is no effective treatment, and children with the disease usually die within a few years of the onset of symptoms. See also sphingomyelin lipidosis. Metabolism A rapidly progressive AR storage disease with progressive neurologic damage due to sphingomyelinase deficiency; NPD type A is AR, more common in Ashkenazi Jews and is characterized by accumulation of excess sphingomyelin and cholesterol in the brain, BM, liver, spleen Clinical Early infancy onset with feeding problems and delayed or regressing motor development, progressive vision and hearing loss; late onset NPD is characterized by movement disorders and seizures. See Niemann-Pick cell. An autosomal recessive hereditary disease in which the absence of an enzyme causes defective metabolism of SPHINGOMYELIN. A sphingolipidosis. There is abnormal accumulation of sphingomyelin causing enlargement of the liver and spleen, anaemia and severe neurological damage leading to physical and mental retardation and often death in early childhood. At least six varieties, having differing prognoses, have been described. Some have onset in adult life and do not affect the nervous system. The gene was identified in 1997. (Albert Neimann, 1880–1921, German paediatrician; and Ludwig Pick, 1868–1935, German physician). The pathogenesis and treatment of acid sphingomyelinase deficient Niemann-Pick disease. Substrates and internal standards were developed for Gaucher, Fabry, Pompe, and Niemann-Pick diseases, and more recently, for MPS-I. Biotechnology company CTD Holdings Inc (Other OTC:CTDH) reported on Thursday that it has started enrolling patients under its Phase I clinical study in the US to evaluate the intravenous administration of Trappsol Cyclo in patients with Niemann-Pick Disease Type C (NPC) at the Children's Hospital & Research Center Oakland. Elliott has Type C Niemann-Pick disease in which cholesterol builds up in the liver, brain and spleen until it kills. Only 45 children have been born with Niemann-Pick disease (Type C) which is triggered by parents carrying an abnormal gene. The LSD Screening Panel tests for Krabbe disease, Gaucher's disease, Niemann-Pick disease (Type A and Type B), Pompe disease, Fabry disease and MPS I. Money raised will go to Children's Hope Foundation, Just for Kids, the Niemann-Pick Disease Group, and the Chronicle's Sunshine Fund.